Flow-UV™ is an affordable in-line UV-Vis detector for flow chemistry applications. The flow cell utilises transparent PFA reactor tubing and may be positioned virtually anywhere in the flow path. At room temperature, this configuration can withstand pressures of up to 35bar. Dispersion and steady state may be monitored at 5 user selected wavelengths in real time to assist with product collection and quality control. 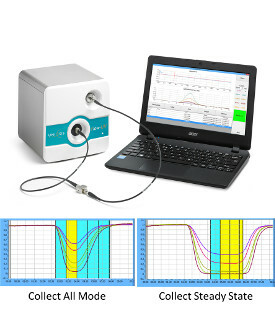 The spectrometer control software allows saved methods to be re-called and will automatically record a background spectrum at the start of each experiment. Please note: the image shows the Flow-UV (UQ1100) fitted with the optional continuous flow cell and optical fibres (UQ1102). A very useful accessory for all flow chemists!